The main reason I started blogging was a community thing. I leeched from the community to get me to where I am in my career, and it was to the point that the community was owed something in return. Everyone can give back in their own way, some answer forum questions, some blog, and some people find their own special way. For me, trolling for forum questions that I could answer that weren’t already answered adequately wasn’t for me; nothing against those folks, it’s just my preference. So I decided that I was going to put things in my own words. My words were on the tip of my tongue, but there was a road block. Please, don’t laugh at me too much, but I didn’t know how to get my words out there. All these people had cool blogs where they programmed ways for people to leave comments, they programmed this odd little word cloud thing for links to keywords, WOW…they programmed ways to have keywords. I’m out of my league, I’m a SQL nerd, I don’t do this stuff, I can’t do this stuff. When I’m not too busy being bitter, it’s actually quite humorous how I took the long way around to discover WordPress. Those “geniuses” out there knew something I didn’t, and the thing they knew that I didn’t wasn’t how to be a master programmer of cool toys. Man, I feel like a fool! I’m not selling WordPress here, it’s what I use. Other platforms are comparable; I know that now. The important thing to know is that if you can write an email, you can write a blog. The only trick is copy/pasting code from your editor to WordPress, which I found a cool tool to help you do this. There, my secrets are out, I just told you how to bypass all the big bumps in the road that looked like brick walls to me. WAIT!!! It’s not that simple. I started and it wasn’t what I expected; same as everything in life, I guess. Blogging wasn’t a small little thing you do on the side and carry on with your life. It becomes a part of your life. 10 people viewed this stuff, and this is stuff that would have revolutionized my career 10 years ago if I would have read it back then. How can I get more viewers? I’m obsessed with view counts, I want this message to go EVERYWHERE!!! How can I write it better? I want the message to mean something and be something people want to read. How can I get myself to stop writing in spurts with 4 posts this week, no posts that month? I hunted down my favorite blogger and begged for help even though he didn’t even know my name. 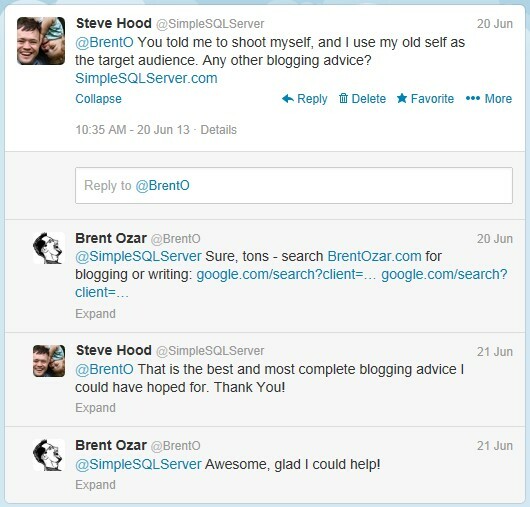 He was quick to give advice and search his site doing the following searches on Google “site:brentozar.com blogging”, “site:brentozar.com writing”, “site:brentozar.com presenting”. AMAZING and SCARY all at the same time. You’ll get information ranging from starting blogs to who your target audience really is (and shooting yourself) to the 51 steps to make an awesome presentation. Some people show you the rabbit hole and let you go as deep as you want. I felt like I hit the bottom of the bottomless rabbit hole with a solid thud. Brent, I’m not sure if you’re reading this or not, but you’re the only person out there without a college degree who deserves a doctorate in communications on top of your Microsoft MVP and MCM titles you have earned. This is a cross between a “Thank You” and a “Why Me???”. More of a thank you, though. You taught me a lot. Don’t go thinking that you’re going to hear Brent’s point of view restated here though. I enjoy what he has out there, but my point of view is my own. For instance, I just received an automated email from his group saying “But if you want to be a professional DBA, you should leave the developing to the developers.” in reference to creating tools to monitor the servers, leaving me almost with the impression of not reinventing the wheel, while my blog is largely comprised of a blueprint for a wheel. He continues with “I’m not saying you shouldn’t learn the dynamic management views (DMVs), how to dig through them to find the evidence you need, and how to turn that data into actions. Hopefully, I’m going to teach you how to do a lot of that over the course of the next six months.”, so maybe I’m mistaken. You know what, I’m off subject now and you really just need to got to his free email-based accidental DBA class and make up your own mind. Back on topic now… The blog is now syndicated, so it’s showing up on SQLServerCentral.com and ToadWorld.com. More over, about 1/4 of my posts are highlighted by SQLServerCentral.com’s emails that go out to thousands of people and make my views go through the roof. At this point, on September 3rd, I have already had more views on my blog for September than I did for the entire month of July! I’m also writing ahead of time, scheduling posts to go out at 4:00 AM my time (ET) on the second business day of each work week (Wednesday for this post), giving me time to review my work while also providing some consistency and a scheduled commitment for me to keep myself inline. So many things have changed, all for the better, and I’ve only been at this for about 4 months by the time this is scheduled to go public. I’m learning the little details to be able to explain it to others without misleading them. This is my blog’s namesake, in case you were wondering. What I’m writing is being read by and used by the community. People look up to me, even if that’s only in my own mind. Learning it well enough to teach makes you really learn it and be more confident. It is on my resume and employers LOVE it. I’m excited about the technology I use at work enough to spend my free time on it. You can feel confident giving me any employee and know that I can and will teach them. I know if I had this early in my career, I would have been down the rabbit hole of system tables and DMVs years ago. It would have changed things for me, and I can only imagine that I’ve had that effect on one or two people. Once you know about the DMVs, there is no going back. You took the wrong pill and you’ll never wake up knowing that the world was what you once thought it was. Welcome to the Matrix! Ok, it couldn’t all be good. I want more read counts, I want the message out there more, I keep looking for read counts, I keep looking to better myself, I keep looking to better my posts, aaaahhhhhh, I’m trapped, help me!!!! Also, without this, I wouldn’t have the confidence and background to say that I’m ready to be a presenter. However, here I am putting the last details into my part of SQL Saturday #250! See an outline of my presentation right here on my blog. SQL Server Central highlighted my posts on weeks 20, 21, 25, 26, and 34. Steady growth otherwise. So, here I am, 4 months and 10,000 reads (WordPress + SQLServerCentral Syndication) later, and I’ve learned a thing or two. By no means am I perfect; this is a continual learning experience. For all those who have something to say out there, stop saying you have something to say and start saying it. Syndicate it if you want others to read it. The readers will come with time, just keep writing and strive for something worth a syndicator highlighting in their newsletters. Who knows, maybe I’ll even make it to the SQL Rockstar Rankings someday. Read about writing to improve yourself. Then, finally, be ready for a better you. If you do blog, what has it meant to you? If you don’t, why not? I’d love to hear more people’s take on this as everyone has a unique experience and thought process. Aww, thanks! About the reinventing the wheel – it’s about knowing your target audience. That email class focuses on people who want to learn to be a purposeful DBA over the next 6 months. If you’re learning to do that, you shouldn’t be building things at the same time. There’s only so many things you can learn simultaneously that are unrelated to your company’s core business. Keep up the good work! Thanks. I wasn’t quite sure what others view was on capturing stuff that 3rd party tools can do, but I find it incredibly useful to have everything in formats you can query easily. My view still is that you should reinvent the wheel if you can make an awesome wheel that you’ll use every day. And thank you for everything you have on your blog. It did a lot for my blog, and even more for my upcoming presentation on SQL Saturday.